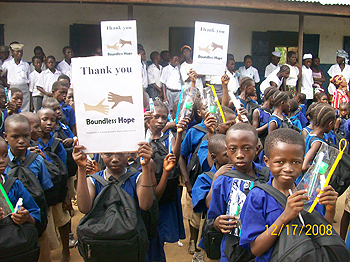 Children in Sierra Leone show their gratitude for donations of much-needed supplies in Dec. 2008. The Ministry of Education, Youth and Sports is entrusted with the mandate of supervising education in Sierra Leone. It has done a lousy job, having failed to provide a high standard of education, especially for the perennially deprived and at-risk kids in this tiny war-torn nation. Education is the incubator and vanguard that should drive development and unshackle the undeveloped mind. Education prepared Barack Obama to rise to the office of president of the United States, the most powerful position in the world. But public education is broken in this recovering nation, where teachers are functionally the Cinderella, working a thankless job that nobody else wants. They are the poster child of disrespect and indignity, unable to compete with the rest of society for descent housing or an optimum lifestyle. This society gives them very little, yet expects the highest standard of integrity and professionalism from them. Private schools in Sierra Leone provide a far better quality of education for their kids. They have deep pockets with a vested interest and the tenacity to advocate for a reasonable limit to government control. Some private schools do not take part in state-run public exams, opting for foreign exams conducted in London or by other examination boards. After these children complete secondary education at private schools, their families can afford to send them to colleges and universities in the West, mostly to England and the United States, the best education that money can buy. Trained and qualified teachers migrate to private schools, leaving the poverty-stricken and rundown public schools that cannot pay them well. Comparatively, private school teachers earn remunerative salaries with benefits, and they usually get paid on time. Historically, the private sector, including NGOs, has done more for education than the government, showing a passion and dedication to making a difference educating kids from diverse backgrounds. Government has grown more complex and inefficient, lacks sufficient funding and is ineffective in running the schools. Returning government assisted schools to their previous owners or managers may be a plausible vision, with limited control over privately funded schools. Mission schools, like NGOs, have invested a fortune in primary, secondary and higher education and produced credible results, instilling a passion for discipline, high standards and integrity. Since the complete take over by government, these institutions have taken a nosedive and have not recovered. The indictment from critics that public education has been politicized by government is a legitimate one. Government bureaucracy and its tardiness in implementing necessary policies has forced some philanthropists to opt out of privately funded education for good. Former President Tejan Kabba introduced a 6-3-3-4 education system in which primary education runs for six years, followed by secondary education that is divided into two three-year cycles, and finished with four years of higher education. This innovation, replicated from Ghana's framework, has stalled because of inefficient planning and inadequate funding. A nation that is still picking up the pieces of war lacked the capacity to implement such a huge capital-intensive program, with its infrastructure in ruins and desperately gasping for life support. The current President, Ernest Bai Koroma, who was himself a teacher, though briefly, has expressed dismay and disappointment at the nation's failing educational system. He has set up a commission to study its shortcomings, make recommendations to fix the broken system and turn around the dismal performance of students in public examinations. The nation put up two consecutive disastrous performances in public examinations where it competed with other West Africa nations. In a country where schools are measured by their performances at public examinations, President Koroma found this disgraceful and unacceptable. Research conducted jointly by UNICEF and the Education Ministry revealed that about 300,000 school children are out of school in Sierra Leone. An earlier report had estimated that about 375,000 kids, mostly girls, had dropped out of school. The decrease in the dropout rate is attributed to the establishment of community schools and the passion and generosity of NGOs in the Diaspora, including former child soldier Ishmael Beah, who built a school in his village through his foundation. He also donated about $22,000 to help fight illiteracy and make education available and accessible, especially for the mentally and physically challenged kids and orphans in Sierra Leone. The dropout rate is disturbing. The systemic malaise of poverty continues to dog the suffering and less fortunate. Child labor is a prevalent factor that prevents children from going to school. These children, mostly girls, become peddlers or take part in petty trading to help their parents generate needed income. Teenage pregnancy and very early marriage to older men is not at all uncommon. Even though primary education is officially free, their parents cannot afford to provide basic needs such as books, uniforms and school supplies. The boys fetch water in five-gallon containers to sell for about a dollar to the highest bidder. The faces on the kids who do go to public school tell a bleak story. Some of them do not have breakfast, and there is no guarantee that they will receive lunch. Many teachers feed themselves with artery clogging secretion. They make about Le 250,000 a month (less than $75). Some have not received their salaries for four months to a year. Two weeks ago, Dr. Nyallay, the deputy minister of Education Youth and Sports, paid out a backlog of salaries to 617 teachers approved since the 2006/2007 academic year. These teachers are in the south, east and western rural parts of the country. The Sierra Leone Teachers Union claimed that about 4,000 teachers have not been paid for about a year. In August it was reported that Tamba Borbor, a despondent Roman Catholic primary school teacher in Dia Town who was not paid for two years, hanged himself with the sleeves of his shirt tied to the branch of a tree. Tamba was going through very hard times and had borrowed money from creditors. He was fooled repeatedly by school authorities that his name was not on the school voucher but on that of a neighboring school close to Guinea. He made the long trip there, only to find out that he was again duped by the school officials. This chronic problem with late payment of salaries could be alleviated by computerizing the accounting system to expedite the processing of employment papers. Now, schools pay new teachers from their own funds and government later reimburses them when the papers are approved. But corruption is endemic and fleshy here. Ghost teachers regularly appear in large numbers on school vouchers, receiving salaries on payday. They include electricians, plumbers, security personnel, who were registered to pose as teachers. This is not a novelty to most Sierra Leoneans. Other government employees face similar contempt. High profile, greedy government officials team up with dishonest school authorities to siphon money from the nation’s treasury. In some cases, payments have been made to ghost teachers at fictitious institutions. How can such a treasonable act escape independent auditors and the Anti-Corruption Truth and Justice Squad? The argument that government has no money to fund education in this donor-driven economy is bogus. Politicians and their cronies live eye-popping lifestyles, nursing an obsession for items that are status symbols, such as the latest models of Hummers that cost about $30,000-$63,000. The selected and connected access a sea of foreign currencies, especially the highly favored women who can afford to go on shopping sprees, spending about $40,000 at Macy's in the U.S. or the designer stores in London. But where are they getting the money? Sierra Leoneans in the Diaspora and folk back home are asking, why is it we work so hard yet we cannot afford such a flamboyant lifestyle? Are the politicians serving the populace or the populace serving them? The government needs to start rebuilding this ailing system from the bottom up. Primary and secondary education should be made affordable. The reservoir of Sierra Leonean experts in the U.S., proficient in their various disciplines, would love to give back to their motherland by helping to fix the outmoded and failing system. Whether it is English, reading and writing, math skills or computer science and technology, they have the gray matter to innovate and inspire students in Sierra Leone who are thirsty for modern skills that would make the learning process exciting and rewarding. I hope President Ernest Bai Koroma will deem it urgent and necessary to request their expertise and tap into their invaluable skills and professionalism. If education is cumbersome or expensive, who wants to try ignorance?